Government Senior Secondary School at Sidhwan Bet, Ludhiana district: Students claimed their science teacher Praveen Gupta hadnot turned up even once in the class to teach them. Hundreds of advocates abstained from work, chemists downed shutters and local residents staged protests in various parts of the town, insisting that the state government should take back the transfer orders of SSP Ravcharan Singh Brar. Oil and Natural Gas Commission’s former engineer I.S. Kalsi was today asked by the Punjab and Haryana High Court to submit his report on uranium content in Malwa waters. The Punjab and Haryana High Court has directed Pathankot Deputy Commissioner to prevent illegal mining in villages and to depute an officer for maintaining a vigil. Deputy Chief Minister Sukhbir Singh Badal today said instead of convincing the UPA government for announcing a relief package for state farmers on account of a deficit monsoon, state Congress MPs were indulging in petty politics. In another jolt to Peoples Party of Punjab (PPP) chief Manpreet Singh Badal, party leader and former SAD MLA Didar Singh Bhatti, who had unsuccessfully contested the last assembly elections from this constituency on PPP ticket, has announced to return to the party fold on August 15 along with his supporters. Its earlier request having gone unheeded, the local Sri Guru Granth Sahib World University has again written to the University Grants Commission (UGC) for getting an inspection done of the Sikh institution. In view of the high demand for professional courses, the Guru Nanak Dev University (GNDU) has given its nod to all affiliated colleges to increase seats in undergraduate and post-graduate courses. Close on the heels of reported allegations regarding money exchanging hands between IGNOU and Punjab Technical University (PTU) officials for granting approval to run distance education programmes, the PTU authorities are in the dock for yet another reason. Sikh pilgrims will have the option of visiting the five Takhts in one go as part of a special package this winter. Criticising the Centre for blaming the state for the recent grid failure, Punjab has demanded that the central committee probing the two instances of grid collapse must include members representing states. Charan Kaur (85) of Chack Mehra village died of gastroenteritis at a private hospital in Dasuya last evening. Former Punjab Congress chief Virendra Kataria has lodged a protest with the Railway Ministry for his “humiliation” at the inauguration ceremony of the Abohar-Fazilka rail line at the instance of senior state leaders. Education Minister Sikander Singh Maluka today conducted surprise checks in various schools of Bathinda, Barnala, Sangrur and Ajitgarh districts. As many as 97 per cent of the students of government primary schools in Punjab belong to Dalit families, a survey conducted by the Government of India (GOI) has revealed. An advertisement by the Genesis Institute of Dental Sciences and Research, Ferozepur, inviting applications for leftover NRI seats in the college has led to resentment among students and their parents. Experiments conducted by experts of Guru Angad Dev Veterinary and Animal Sciences University (GADVASU) in waterlogged areas of Muktsar and Ferozepur districts for the last five years have finally yielded results. Punjab Mandi Board chairman Ajmer Singh Lakhowal and vice-chairman Ravinder Singh Cheema are at loggerheads over implementing the Centre’s directive to make payment against the procurement of produce directly to farmers. More than two months after a client created a flutter in the Punjab and Haryana High Court, claiming that an advocate had received Rs 36 lakh for procuring a favourable decision, an inquiry report into the incident has recommended a detailed probe. Three persons have died after consuming hooch (illicit liquor) in Johal Nangal village falling under Ghuman police station. The condition of five others is said to be serious. The body of a newborn male child was found from a bathroom of Government Rajindra Hospital today. Two persons, including an octogenarian woman, were crushed under a tipper-trailer near BN Khalsa School in Tripuri area today. Government Model School at Bharthala, Ludhiana: Students claimed their art and craft teacher Seshpal Singh regularly bunked classes citing one reason or another. Government Senior Secondary School at Hambran, Ludhiana: Students claimed their English teacher Seema Moudgil never gave them written work. Government High School at Gurhe, yet again in Ludhiana district: Students claimed their science teacher was medically unfit but was still reporting for job. Officials from the Directorate of School Education recently came across such glaring facts about the allegedly collapsed education system in government schools of Ludhiana district during surprise raids conducted last month. In all, 165 schools were inspected in Ludhiana district alone in the last week of July. As many as 26 teachers were found absent from duty while 61 turned up "late" or "very late". Twenty-four were "missing" for the last six months to more than 10 years; apparently having settled abroad. Apart from Ludhiana, raids were also conducted in Bathinda (36 teachers found absent; 21 arrived late) and Patiala (16 found absent; 36 arrived late) districts. Six teachers in Bathinda and seven in Patiala had not reported on duty for the past several years. There were also cases where teachers had marked their present but were found absent from duty. In another peculiar finding, inspection teams noticed that two adjoining schools near Samrala had six teachers each of a particular subject against the student strength of a mere seven. In comparison, there were some schools where one teacher was taking care of over 60 students. There was another example of a middle school having 35 students and six teachers while in an adjoining primary school, there were two teachers for more than 150 students. An official note written by School Education Director Kahan Singh Pannu after the inspections (The Tribune has a copy) points out the need for rationalisation of staff. Pannu said, "Qualitative changes can only be ensured if basic groundwork is carried out properly." Aiming to make the erring teachers fall in line, inspection officials have constituted teams that will randomly choose three to four schools in each district on a daily basis and conduct surprise checks. Regular offenders will invite departmental action, sources said. The Director General of School Office has sought a list of Class VI students from all schools who cannot speak or write Punjabi and Hindi. "It is appalling to find a Class V student in a school in Bet area who is unable to write his name in his mother tongue (Punjabi)," a member of an inspection team said. Three youths threatened to immolate themselves if the authorities did not give in to their demand in 24 hours. The government has transferred Brar to Kapurthala and Amritsar SSP (Vigilance) Raj Jit Singh has been posted as the new SSP. Brar, whose tenure lasted less than 100 days, had earned kudos from the residents for bringing down the crime rate in the town which had become a safe haven for petty criminals, including chain-snatchers. At the same time the officer had reportedly earned the wrath of former Agriculture Minister SS Langah for not bowing to his diktats. Brar had joined as the police chief when the morale of the force was low with the town witnessing violence after a young engineering student, Jaspal Singh, was killed in police firing on March 29. Sources say the SSP had displeased senior Akali leaders for his apolitical style of functioning. He had recently transferred three SHOs out of the district despite Langah’s instructions to the contrary. Two of the SHOs were reportedly close to Langah. The third SHO is believed to have had the backing of former Education Minister SS Sekhwan. Brar had shot of a strongly worded letter to the IG (Border Range), highlighting the criminal-politician nexus in the district. As recommended by Brar, the IG transferred SHOs Paramjit Singh, Jarnail Singh and Sat Pal out of the district and these transfers antagonised local Akali politicians. Gurdaspur-based Punjab and Haryana High Court lawyer Ramdeep Partap Singh said that law and order in the town, which over the past six months had deteriorated, had improved significantly under Brar. “Hundreds of women, who earlier would not venture out of their homes for fear of chain- snatchers, now walked fearlessly on the streets,” he claimed. Brar had earned the respect of local residents for the manner in which he had defused the potentially volatile situation when Sikh radicals took out a protest march, raising pro-Khalistan slogans, on June 20. “The SSP’s man management skills came to the fore when he convinced Sikh radicals Baljit Singh Daduwal and Wassan Singh Zaffarwal to stay keep from the protest,” said Jatinder Pal Singh, who heads an NGO. Meanwhile, hundreds of protesters blocked traffic on the Gurdaspur-Dhariwal road for the second successive day today even as a delegation of residents handed over a memorandum to Deputy Commissioner Dr Abhiva Trikha, seeking the cancellation of Brar’s transfer orders. 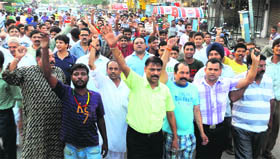 Protests were also held in the neighbouring town of Dinanagar. Brar earned the respect of local residents for the manner in which he defused the potentially volatile situation when Sikh radicals took out a protest march on June 20. The officer’s man-management skills came to the fore when he convinced Sikh radicals Baljit Singh Daduwal as well as Wassan Singh Zaffarwal to stay away from the protest. Various social organisations, including the Gurdaspur Beopar Mandal, have called for a bandh in the city on Tuesday to protest against the transfer of the SSP. Some senior BJP leaders are supporting the bandh call too. The Chemists Association of Gurdaspur has written to the Chief Minister to reconsider the decision to shift the district police chief. The directions came after Kalsi claimed before the Division Bench of Acting Chief Justice Jasbir Singh and Justice Rakesh Kumar Jain that he had carried out an extensive study on the issue. As the water contamination case came up for resumed hearing, Kalsi told the court that the comprehensive report was brought to the notice of the authorities concerned in the State of Punjab, but action was just not initiated on the basis of his findings. Taking note of his assertion, the Bench asked Kalsi to place before the Court a copy of his report in the matter. Already, the Bhabha Atomic Research Centre (BARC) has asserted that only reverse osmosis (RO) system will help reduce uranium content from drinking water in parts of Punjab. The BARC, in an affidavit, said a recent study carried out in uranium-affected areas of Punjab showed that the RO system was highly effective in removing uranium from water. “The BARC has only recommended for uses of RO system but it has not installed any RO system in Punjab,” the affidavit added. The High Court is hearing a petition filed by advocate Barjinder Singh Loomba, seeking relief to the affected people and children in the villages of Bathinda, Faridkot and Ludhiana due to leakage of uranium in water and to find out the source of leakage. The significant directions came on a petition filed in public interest by Surjit Singh against the State of Punjab and other respondents. He was seeking directions to the State and other authorities concerned to stop illegal mining going on in the villages in Pathankot district, including Simbli Gujran, Talwara Jattan, Beli Changan, Kontarpur Kothe, and Gharota Khurd. Digging deep into the issue, the petitioner had alleged that the mining mafia was extracting mining minerals in the villages without getting permission from the competent authority. As the case came up for hearing before the Division Bench of Acting Chief Justice Jasbir Singh and Justice Rakesh Kumar Jain, a reply on behalf of the State and other respondents was filed by way of an affidavit by Mining Officer with the Department of Industries and Commerce Rajesh Kumar. The affidavit said Pathankot Deputy Commissioner had already constituted a team under Pathankot Sub-Divisional Magistrate’s Chairmanship to check illegal mining in the villages. The respondents further claimed the department had also deployed two inspectors and two guards for inspecting and checking illegal mining in the area. Raids too have been conducted and FIRs registered against the guilty individuals, the affidavit said. Taking on record the affidavit, the Bench asserted: “Under the circumstances, we feel that the authorities concerned are taking appropriate action in the matter. Therefore, no further direction is required to be issued by this Court, save and except directions that the Deputy Commissioner, Pathankot, will ensure that no illegal mining activity be carried out in the villages mentioned in this writ petition. Disposing of the writ petition, the Bench concluded: “The Deputy Commissioner shall also depute some officer to keep a watch so that no person could carry out such illegal activity”. Addressing a public gathering after inaugurating an over-bridge, constructed at a cost of Rs 17 crore here, Sukhbir said: "The statement by Congress MPs that drought relief should be given directly to the farmers and not through the state government is extremely unfortunate". The Congress leaders have been issuing baseless statements aimed at attacking the SAD-BJP government, he said. Commenting on the issue of “differences” between the BJP and the SAD over the proposed taxes, Sukhbir said there was no truth in such reports as all decisions were being taken after a mutual understanding between both the alliance partners. On the issue of the rising underground water pollution in the state, the Deputy Chief Minister said a number of sewerage treatment plants were being set up in all districts of the state and within the next two years, water being discharged by factories and municipal bodies in all districts would be treated. Sources said Bhatti had been approaching his supporters in various villages of his constituency for seeking their views in this regard. They said Bhatti would join the party in the presence of SAD president and Deputy Chief Minister Sukhbir Singh Badal, who is likely to address the people here on the Independence Day. Bhatti said he would join the SAD during the Independence Day function to be held at Dana Mandi, Sirhind. He said more than 90 per cent of his supporters would also join the SAD. The former Sirhind MLA had joined the PPP after the SAD had decided to allot party ticket to Prem Singh Chandumajra. Senior SAD leaders said Bhatti was denied the ticket as his nephew Gurpreet Singh had joined the PPP. Sources in the SAD said the move was being seen as an attempt by Bhatti to save his relatives from probe into their alleged involvement in the illegal sale of land. On the other hand, Bhatti has refuting the allegations and said some of the party workers who did not want him to return to the party fold were trying to defame him. The scrutiny of staff, infrastructure and other facilities would pave the way for UGC recognition to the university. The earlier request was made on January 19. Sources said the latest appeal was made by Registrar Prithipal Singh, who had been given the additional charge of Vice-Chancellor (VC). The post fell vacant with the suspension of Jasbir Singh Ahluwalia. The Registrar said the university was following the UGC norms and deviations, if any, would be taken care of. He said the university had 1,350 students in 18 courses, including mechanical and electrical engineering. Ahluwalia, first VC of the Sikh university, was shown the door following allegations of irregularities and mismanagement of funds. The ouster was ordered by Shiromani Gurdwara Parbandhak Committee chief Avtar Singh Makkar, university Chancellor, on August 2. Makkar had also appointed two auditing firms for inquiring into the alleged mismanagement of funds by Ahluwalia. Sources said the auditing teams comprising eight members had already sealed the VC office and were busy checking accounts of the previous four years. The teams also met the Registrar. Students said Ahluwalia had turned his office into a fortress and had passed strict instructions that nobody be allowed to enter it without his permission. Besides, he had hired private security personnel, a few of whom would always stand guard outside his office. The security agency was paid a whopping Rs 3 lakh a month by the university, said sources. Apart from this, the university was footing a monthly bill of around Rs 80,000 on fuel and other expenses of the three luxury cars used by Ahluwalia. A few teachers alleged that while they were ignored by the VC for annual increments, he gave a hike of Rs 1,200 to Rs 1,500 a month to his aides. A communication to this effect has already been dispatched to around 150 colleges located in Amritsar, Jalandhar, Gurdaspur, Tarn Taran, Kapurthala and Nawanshahr to increase five seats in each of the courses that were in demand. However, the move would be applicable only for the current session (2012-13). Among the undergraduate courses that were in demand were BCA, B.Sc (Information Technology), BBA, B.Com, B.Com (Regular), B.Sc (Computer Science) and B.Sc (Biotechnology). In post-graduation category, the most sought-after courses comprise M.Sc (Computer Science, Information Technology, Mathematics and Zoology) and M.Com. If the list released by the GNDU was any indication, no increase in seats had been introduced in humanities, food science, and life science stream, which implied that there were few takers for these courses. Vice-Chancellor Ajaib Singh Brar confirmed that the seats had been increased. "The colleges informed us about the high demand for certain courses, especially related to information technology," he said. Though the approval granted by IGNOU’s Distance Education Council for running various distance education programmes elapsed on March 31, the PTU has been going ahead with the admission process in more than its 300 centres across the country. The authorities, however, claim that they had applied for fresh permission and as IGNOU was without a VC from a long time, there was pendency in clearing various files. The PTU had obtained permission to run distance education programmes from the IGNOU in March 2010. The university is offering courses in B.Sc (IT), M.Sc (IT), MBA, MCA, M.Com (Professional), B.Com (Professional), BBA, BCA and PGDCA. The university currently has over 1 lakh students enrolled in various courses. The university reportedly earns nearly 1,200 crore from its distance education wing. 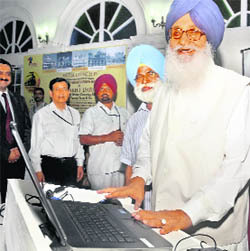 Punjab Chief Minister Parkash Singh Badal today launched the prestigious ‘Panj Takht Darshan’ project. This is a joint project of Punjab Tourism and the Indian Railways. 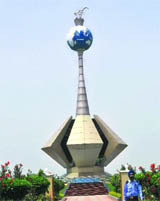 Badal said the project should be seen in the wider context as Sikhism preached oneness of god. Therefore, everyone, regardless of religion and caste, should visit the holy Takhts to strengthen the bonds of universal brotherhood, peace and harmony. The ‘Panj Takht Darshan’ will start on December 30 from New Delhi and the second on March 17. It will be a six nights and seven days journey by train and air. The IRCTC will be in charge of the Sikh Circuit Special Tourist Train, including off-board and on-board services. Air services will be arranged by Luxury Train Group, a marketing agency. Pilgrims can board the train from New Delhi on December 30 or Amritsar on January 1. The entire cost of the tour to and fro from Delhi would be Rs.1,00,001 per person (1st AC) and Rs 90,000 per person (2nd AC). Likewise, the package would cost Rs 97,500 (1st AC) and Rs 88,050 per person (2nd AC) from Amritsar. The weeklong journey would cover Akal Takht, Golden Temple, Jallianwala Bagh, Panj Sarovar Walk, Attari Border (Amritsar), Gurdwara Fatehgarh Sahib, Gurdwara Jyoti Sarup Sahib, Takht Keshgarh Sahib, Virasat-e-Khalsa Heritage Complex ( Anandpur Sahib), Takht Damdama Sahib (Talwandi Sabo), Takht Patna Sahib, Guru Ka Bagh (Patna), Takht Hazur Sahib (Nanded). The Punjab Heritage and Tourism Promotion Board has prepared a 15 years’ tourism master plan for Punjab with the assistance of UN World Tourism Organisation. The CM released a booklet and also launched a booking portal on the occasion. Punjab Revenue and Public Relations Minister Bikram Singh Majithia, representing Punjab at a special meeting convened by Union Power Minister M Veerappa Moily today, said Punjab could not be blamed for the failure of the Northern Grid as the state overdrawal on July 30 (when the grid collapsed) was not more than 5.5. per cent. He alleged that serious offenders like Haryana and Uttar Pradesh, which were overdrawing by 25 per cent, were not being blamed because of political reasons. Majithia said Punjab had purchased power in the months of January and February, anticipating a rise in the power demand by 10 per cent. Majitha expressed concern at the “wrong and mischievous propaganda” blaming the grid failure on overdrawal by Punjab. Haryana, he said, was overdrawing by 22.4 per cent but this had been ignored by the Power Ministry. He listed out the average overdrawal in the month of July by different states. “Punjab has an average of 4 per cent overdrawal, Uttar Pradesh 31 per cent , Haryana 17 per cent and Rajasthan 18 per cent”. Majithia objected to clubbing a disciplined state like Punjab with habitual offenders. Seeking 1000 MW of additional power for Punjab from the central pool, Majithia said because of monsoon failure, farmers in the state were trying to augment their resources to irrigate the paddy crop and meet their obligation to keeping the nation self-sufficient in food stock. Punjab was the grain bowl of India and its power needs could not be clubbed with other states. The failure of government to supply power to the agriculture sector during the paddy season could have long-term implications on the food security of the country, Majitha warned. Demanding an increase in the power transmission capacity to 6,000 MW, Majithia said the present 5,400 MW transmitted to Punjab through the Northern Grid had been fully utilised. He said Punjab was willing to purchase more power on a day ahead basis. Dr Avtar Singh, Civil Surgeon, Hoshiarpur, said at a medical camp at Chack Mehra village, 110 patients were detected with symptoms of mild gastroenteritis and 31 referred to the Civil Hospital, Dasuya. Six had been discharged from hospital today. Eight water samples collected from a water source in the village and had been sent to the Government Laboratory at Chandigarh. Dr Charanjit Singh Kahlon, Senior Medical Officer, Primary Health Centre at Mand Pandher, said the water supply to the village had been discontinued. Chlorinated water was being provided to the residents through tankers. As many as 1,500 chlorine tables had been distributed among the inhabitants. Prem Nath, SDO, Rural Water Supply, Dasuya, said water to Chack Mehra village and five more villages was being supplied from the same tubewell. He pointed out that many residents had got water connections from this tubewell. 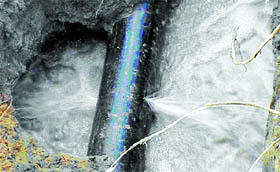 They had installed their own pipes which were leaking at several places. This had led to water contamination. He said the residents had been asked to get the damaged pipes replaced or else water supply to them would be stopped. Gastroenteritis cases have already been reported from Muradpur Awana vilage near Mukerian and Ward Nos 10, 11, 12 and 13 of Dasuya. Kataria had worked hard to make the project a reality. He said despite directions by Railway Minister Mukul Roy that he be included in the list of those to be honoured on the occasion, his name had been dropped from the official list at the last minute on the ``instructions'' of certain leaders who wanted to deny him credit for the project. “I was humiliated... I strongly protest for this...”, he wrote in his letter to the Railway Minister. An official spokesman of the Education Department said the Minister conducted checks in Salabatpura (Bathinda) Government High School at Cheema-Jodhpur and Senior Secondary School at Dhanola (Barnala); GSSS, Phaguwala (Sangrur), and GHS, Ladran (Ajitgarh). The survey examined students of primary classes (I-V) in Punjab and found that only three per cent of the students belong to other categories, but they come from economically weaker families. The government had conducted the survey during the evaluation of the National Programme of Nutritional Support to Primary Education. The educational background of the parents is an important factor for enabling children to continue studies. The survey found that the parents of 50.51 per cent students of government primary schools in Punjab are illiterate. About 23.47 per cent parents have completed primary education while 15.66 per cent studied till class VIII. In contrast, the parents of 24.12 per cent students of government primary schools in Haryana were either matriculate or above. In Punjab, the figure stands at 10.10 per cent. In Kerala, the state known for high literacy rate, the percentage of such parents is 42.01, revealed the survey. At national level, while the parents of 43 per cent students of government primary schools are engaged as labourers in agricultural and other activities, in Punjab the percentage of such parents is 70.65. Further, the survey found that the intake of milk among 21 per cent of kids in Punjab was nil while 13.5 per cent never got fruits at home. The students in government schools in urban areas mainly belong to SC/BC categories. In urban areas, the primary government schools cater to only very poor children belonging to SC/BC and other categories. In the Government Middle School in Bazigar Basti of Faridkot, out of a total of 166 students, 154 belong to SC category while eight were from BC category. Only four students are from general category and they belong to economically weaker sections of society. An advertisement by the Genesis Institute of Dental Sciences and Research, Ferozepur, inviting applications for leftover NRI seats in the college has led to resentment among students and their parents. While the Baba Farid University of Health Sciences (BFUHS) will hold centralised counselling for NRI seats tomorrow, the advertisement came as a surprise for many students who were hoping to get admission on merit. Kewal Krishan, a parent, said: "As per the prospectus, counselling for NRI seats shall be held by the university and only the leftover seats shall be converted into management quota. First the seats shall be filled by centralised counselling on the basis of PMET marks. However, with the college inviting separate applications for filling leftover seats, there is a chance of irregularities." Another parent KK Singla said the Supreme Court's interim order of July 19, 2012 nowhere allowed private colleges to hold independent counselling. "The judgment only allowed them to charge fee of Rs 4 lakh for MBBS and Rs 1.50 lakh for BDS. They have been allowed to get an undertaking from students that the fee is provisional and if the Supreme Court so decides, they may have to pay a fee of $1,00,000," he said. He alleged all private colleges were "openly selling" NRI seats through agents. The university should question the college about the advertisement and announce that the centralised counselling for leftover NRI seats shall be held by it on the basis of PMET marks, said Tarzan Sharma, Sanjay Mittal, VK Kaushal and Pradeep Walia, all parents of medical students. Dr SS Gill, Vice Chancellor, BFUHS, could not be contacted despite repeated calls on his mobile phone and office telephone. Experiments conducted by experts of Guru Angad Dev Veterinary and Animal Sciences University (GADVASU) in waterlogged areas of Muktsar and Ferozepur districts for the last five years have finally yielded results. They have been able to produce 3.5 tonnes of fish per hectare in one year through fish farming. Expressing satisfaction over this feat, Dr VK Taneja, Vice Chancellor, GADVASU, said if the state government provided ample support to the farmers in these districts, around 7,000 hectares of unfit land, where no crop could be sown, could be put to use for fish farming. "The Central Government, through the Indian Council for Agriculture Research (ICAR), had funded the Rs 4-crore project. Punjab has huge potential in aquaculture with productivity of 6.04 tonnes per hectare annually, the highest in the country. On this waste land, we were able to get per hectare 3.5 tonnes of fish of various varieties, including katla, roru and grass carp. Crop profitability in normal conditions ranges between Rs 80,000 and Rs 1.2 lakh per hectare, but through fish farming, one can get up to Rs 2.5 lakh per hectare," said Dr Taneja. He said aquaculture had made great strides in Punjab where production had gone up from 3,000 tonnes in 1980 to 97,037 tonnes in 2011. Most part of land mass in the state was productive except for land in the south-western zone which was salt-affected with lower productivity. Of these, around 7,000 hectares land in Muksar and Ferozepur districts was waterlogged and unfit for farming. Aquaculture was the only option to utilise this land for better returns. Even farmers in these areas feel that aquaculture can provide ample opportunities. Nacchattar Singh from Kot Bhai village in Muktsar said the government should provide one-time grant to prepare fish ponds, fish seed and also ensure advisory, technology and know-how support to promote fish farming on this "dead" land. Lakhowal heads the main faction of the Bhartiya Kisan Union (BKU) while Cheema is the president of Punjab Arhtiya (commission agents) Association. At a meeting of the commission agents of the region here, Arhtiya Association district president Satinder Bhandari and additional president Pramil Kalani regretted that the Mandi Board observed “exceptional haste” in enforcing the directions of the Union Agricultural Minister VK Thomas on making payments directly to the farmers instead of routing it through commission agents. They also resented that Lakhowal had told commission agents in the state to arrange for computerised equipment to weigh the farm produce and use power cleaners to make the grains dust-free. Training guns at the UPA Government, the district officials of the Arhtiya Association alleged that the government, led by the Congress, was pursuing “divide and rule” policy by creating a wedge between commission agents and farmers even when both had been dependent on each other for more than a century. Claiming that Cheema had asked them to protest against the new directions issued by the Board, the commission agents resolved to submit memorandums to the state agricultural minister, through the DCs in all districts of the Malwa region, on August 21. They believe that the new policy would prove fatal to the business of commission agents. They will seek withdrawal of the directions issued by the Mandi Board. They claimed that CM Parkash Singh Badal had assured that justice would be done to the commission agents. The deceased have been identified as Sulakhan Masih, Balwant Singh and Kala Shah. Minda Masih, Natha Masih, Hardip Singh, Manga Masih and Bitta, who were admitted to the Batala Civil Hospital in a critical condition, were later shifted to Guru Ram Dass Hospital, Amritsar. Johal Nangal village is notorious for its illegal liquor trade. The victims consumed hooch this morning. Soonafter, Sulakhan began to complain of loss of vision and breathed his last. As village residents were returning after Masih’s burial, they were told that Balwant Singh and Kala Shah had also died. The police stopped the families of the victims from burying the bodies. Gurmej Singh, DSP, rushed to the village and began investigations. Raj Jit Singh, Gurdaspur SSP, said those undergoing treatment at Amritsar had named one Janak Masih, who had sold them the illicit liquor. He said a case would be registered against Janak Masih. The incident came to light when a sweeper went to clean the bathroom at around 8 am and found the infant lying on the floor. She raised an alarm. After a medical examination, the doctors declared the child dead. Though there are allegations that a woman delivered the child in the bathroom and left him there, the hospital authorities have denied it. Deputy Medical Superintendent Harshinder Kaur said a sweeper had cleaned the bathroom at around 7 am. "Things were normal till that time, but when another sweeper on morning duty went to clean the bathroom at around 8 am, she found the infant lying on the floor in a pool of blood with umbilical cord still attached to him. We have informed the police which is investigating the case," she added. Dr KD Singh, principal, Government Medical College and Rajindra Hospital, said it was impossible for a woman to deliver a baby in the hospital bathroom without anyone anyone noticing her. "She must have brought the child from outside and abandoned him in the bathroom. The child weighed between 2 kg and 3 kg. Though security guards were present in the area, they cannot stop any woman from going to the bathroom". Rajesh Malhotra, Model Town police post incharge, said a case under Section 317 (exposure and abandonment of child under 12 years by parent or person having care of it) and Section 318 (concealment of birth by secret disposal of dead body) of the IPC had been registered against the unidentified woman. The police called in a crane to lift the trailer to take out the bodies. A case has been registered against the absconding driver. The inquiry was marked into the matter and advocate Satvinder Singh Sisodia issued a notice to show cause why contempt proceedings be not initiated against him. The report filed by the Registrar, Vigilance, held Sisodia had no means to lend a friendly loan to his client Darshan Singh. Asserting that Sisodia's defence could not be believed, the Vigilance Judge has recommended a detailed inquiry into the case. Sisodia has been claiming that the litigant, Darshan Singh, had taken a friendly loan of Rs 25 lakh, which he was not paying. The Bench asked Sisodia to hand over a copy of his affidavit to the amicus curiae appointed by the court. After going through the affidavit, the amicus suggested the need for a deep probe. He pointed out that a legal notice issued by Sisodia’s counsel had accused Darhsan Singh of cheating Sisodia by providing him with fabricated documents for filing the case. After hearing the arguments, the Bench marked an inquiry and directed the advocate and Darshan Singh to appear before the District Judge Vigilance. It all began when the Bench objected to an adjournment slip by Sisodia, which read that a senior lawyer representing the respondent was pressurising him to give a no-objection for adjournment. Taking exception to such a slip, the High Court orally remarked that the case deserved to be dismissed. Reacting to this, Darshan Singh from Patiala, stood up and said he had paid Rs 36 lakh to the lawyer in October 2009 to get the case decided in his favour. This amount was in addition to the fee of Rs 2 lakh charged by the lawyer, he alleged.